Art is a graduate of Carisle Military School’s class of 1959. Carisle bought Camden Academy, located in Camden, SC in the late 1970s. 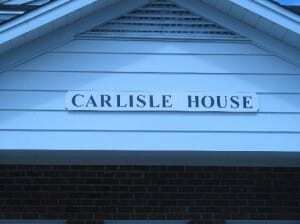 The schools were combined and became Carlisle/Camden. Eventually they both combined at Camden, SC into “Camden Military Academy”. “Camden Military Academy is a school for young men to gain a stronger focus on the educational process. They learn to stay focused with more structure so they can learn better. It’s great college prep,” stated Dumont. 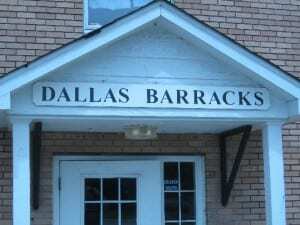 “We have capacity for 300 young men – typically about 275 attend. Last year’s graduating class was from China, Columbia, South America, Panama, etc.” Graduates were from 5 countries and 25 states in all. “Most of the time students’ gain focus on how to learn and then are evaluated on what they’ve learned. Every attempt is made to prepare them for college and 75% of graduates do go on to college,” said Dumont. Sign design and manufacturing process was managed by Auto Cad Engineer Tommy Smith. “Signage is not our business, but the same technology applies to the unlimited intricate grid window and door designs CGP is known for,” stated Smith. CGP has in-house computer capability to produce script letters or any design shape. Tommy designed signage specific to multiple applications and locations. Automated CNC routing reveals the color core letters, black in the case of the Camden signage. The signage has both a decorative and instructive effect. Camden is a low-country architectural style, so the look carried through the ball field, infirmary, maintenance sheds, administration, classrooms, barracks and each building. Camden support keys off of CGP founder emeritus Vic Reeder, who supported a program for young men in Green Bay, Wisconsin. This is not the first time the Reeder family has supported the growth of young boys in a positive environment. Camden is carrying forward Vic’s vision for helping young boys – starting back in the 1960s to current times. It’s a family focus for helping young men.